I have been to Western Turkey. When I went out on the survey trip, the word 'Public Roads Administration' ' Economic meltdown' came out of my mouth. The meaning of it was even the Japanese rich economy which developed most at one time in the world became the debt power owing to the building of highways and buildings. The long and short of it, the word that came out of my mouth seems to tell it was impossible for Roman Empire which had slight population to build countless unimaginable buildings along the Mediterranean coast. Western Turkey has vast plain and gentle mountains. We were blessed with weather and we were able to enjoy the blooming of wild flowers. In addition much supplementary information have been given to our information from 'THE UNIVERSE(THE SKY)=SORA' . It was a wonderful survey trip. I've enumerated in the following which we got and had a confidence further by this trip tentatively. 1) The semicircle of mosque expresses Stone god and minaret (tower) expresses the writing brush(pen) as atoms which composed the bodies of Stone gods turned into this shape in order to convey Stone gods. 2)There are Roman architecture and Architecture of Greek Style in Turkey. However those architecture were made by Stone gods of this region because they discussed to leave the ruins so that they would show Stone gods. I thought Turkish people should not think those ruins were made by foreign people. 3) There are old sarcophagus and they show the ancestors of indigenous people generated here. In addition there are baths and lavatories by which Stone humans took care of humanity and it was the same with Rome. 4) I was told gentle hills and rich soil were made by the woman Stone gods in Cappadocia who gave the direction to the fellow Stone gods to serve for humanity. They are the same with the plain in California, Tokachi plain which is related with Shinsen swamp in Hokkaido, Japan and Noubi plain which is related with Mt. Gozaisyodake, in Japan. 5) I was told the rocks like mushrooms in Cappadocia show the hat=Stone god has brain and the part of neck is white shows they are telling the truth. 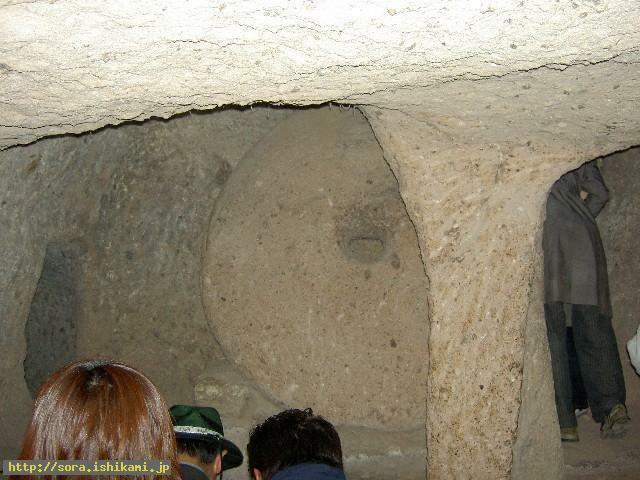 6) The rock rooms like underground city where they say several thousands of people lived there. As the rock is soft, it is said those rooms were made by humanity. However the wall is made of very hard rock and they are not crumbling. I was told the underground space of unknown meaning show atoms of the part of the space formed Stone men. The under part which is crumbling, is made as the atoms there are going to crumble because humanity don't come there to see it. It is the same with the crumbled rocks in Great Ocean Road in Australia. Stone men were made in the rooms. The mushroom-shaped hats represent Stone gods have brain and white necks of mushrooms represent they are telling the truth. Donut-shaped stone tools represents the thoughts of Sagittarius and Stone humans recalled they are the atoms from Sagittarius when they saw it. Donut-shaped stone is like the door and it showed itself to the Stone humans who were going out of the hole by moving itself, was told to me through channeling. "The one whose shape is round is speaking. I'm the Stone god of Cappadocia. Thank you for your telling me. I was told by the Ruler's Stars if I would make lots of basements, humans would realize the existence of Stone gods. I changed my body into many basements as I believed what I was told by the Ruler's Stars . I turned into the rocks whose shape are ones with the hats on them so that they were able to become the landmarks which show there are basements under them. I told the atoms in the universe to use my body. Therefore a lot of atoms which wanted to be humans came here." 7) The stone implements which were made by increasing the size and thickness of five yen coin expresses the thought of Sagittarius. When Stone humans who saw it , they were made to come to mind that they were the atoms who came from Sagittarius. 8) There are vertical holes like deep wells. 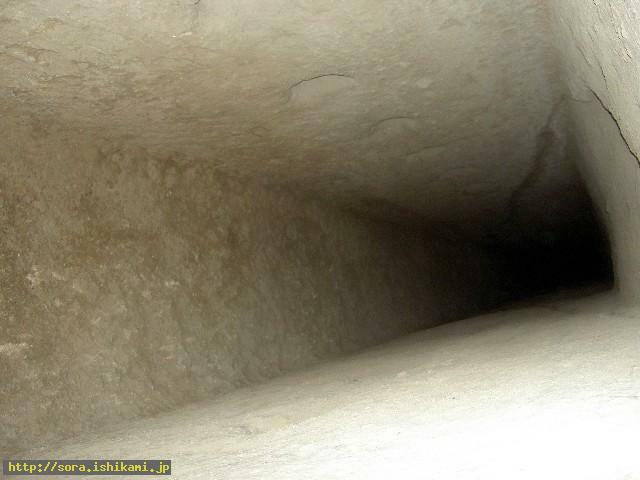 The vertical holes have the depressions on the walls of them which were used for hooking the hands of Stone humans who were formed in the deep place of the basement. Those Stone humans seem to have gone out of the deep basement through the holes like wells. 9) The rooms inside Cappadocia have the ceilings which are high enough for humans to walk without bending down in places but the ceiling of the corridors are low and humanity have to walk by bending down. It shows Stone humans there were small. The sarcophaguses are also small and it seems to show Stone humans and humanity brought the children up together. 10) I saw fault clouds every day over Cappadocia. Stone humans in Turkey who were sealed and were regarded as bad guys were crying. 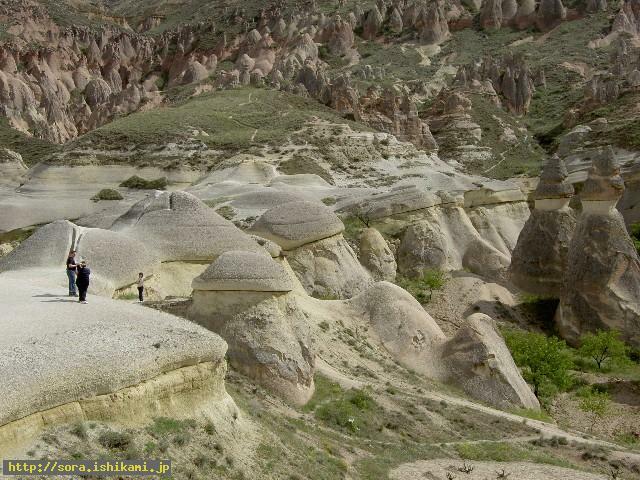 Cappadocia has been conveyed as the things which should not see in Turkey.